Mr. Murray and Thumbkin is a lovely and funny rhyming story. It starts in the morning and ends at bedtime, so it is ideal for a nice bedtime story. 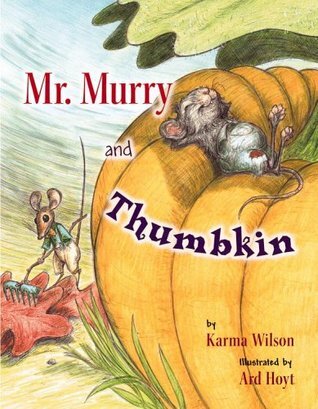 Mr. Murray and Thumbkin is one of those rhyming stories that is a joy (and NOT a job) to read aloud. The language of the story is spot-on, character specific and because it rhymes, it’s easy to remember. This is a funny story that can support memory skills and language skills. What’s even better, it’s about learning to compromise and live with others in balance. The illustrations are compelling and just very clever, created fully in colorful pencil drawings that are highly textured with a lot of attention to Character Details. The illustrations don’t just show the story, they support, enhance and expand upon the rhyming words. It’s an expert work of art. For these reasons, Karma Wilson and Ard Hoyt are creators whose work I follow. Karma Wilson is a prolific storybook author, having written over fifty titles in her career so far. Her books most often rhyme, as a manner of helping kids strengthen their language skills and ability to memorize. This is her trademark and clearly her passion. Ard Hoyt is also quite busy, creating softly inviting pencil drawings of characters. His careful attention to detail reveals certain aspects of the characters we might otherwise miss in the text. Because he shows us that detail, we remember the words all the better. This is a story about two mice of very opposite characters who learn to compromise, team up, and live a better and fuller life together. One mouse, Mr. Murry, is fastidious but worries all the time. His neighbor, Thumbkin, is the exact opposite: lazy but good-humored. Both mice are flawed and yet both have their individual strengths, which is happily played-out in the sweet conclusion. Their friendship and caring for each other makes for a happy ending. There are only two characters in this book, the two title characters – who indeed carry the book. However, one could also say that there are two other Players that are key to this story: their two very different homes. Mr. Murry lives in a tidy teapot, a well cared for home that he cherishes and busily maintains on a daily basis. Thumbkin lives next door in a pumpkin, and as the weather changes and Thumbkin occasionally gets hungry and nibbles on his own house, it slowly deteriorates. Sooner or later, Thumbkin’s house is going to collapse, and Winter is near! It’s more than just funny. This is a well-crafted story full of careful detail. As a reader you can sense the love that went into creating these pages. It is ideal for pre-readers who can sit on your lap or next to you as you read. The dialogue is funny and entertaining for older kids as well (and me). This book has several giggles in it and makes for a sweet story with funny, rich characters and a very nice conclusion that makes for a very satisfying read. The rhyming, rhythmic tempo of the text is an excellent way to help strengthen language skills. The language of the story is endearing and memorable, so kids will often recite their favorite text afterward. The moral story is primarily about compassion and friendship, and secondarily about learning to compromise. For any writer who is looking for clues on how to strongly establish a character through dialogue saturated with personality despite brevity and rhymes (hard to do! ), you can’t go wrong with this text. Readers easily find character voices to use for Mr. Murry and Thumbkin when reading aloud. For any illustrator who wants to study how to delineate and imbue life into anthropomorphic animal characters, this is an excellent guidebook. Ard Hoyt’s forte is drawing likable characters that are so funny and endearing you forget they are not actually men, but mice. Linguistic and memory skills are exercised here through some rhyming text that in some moments is almost musical. Because it’s also funny, kids really remember it. There are several very simple messages in this sweet story. Learning to compromise, learning to be both fastidious and fun loving, and to be compassionate. Perhaps most important is the message that a mouse should not eat their house – even if it is a pumpkin! This story’s dialogue is so well crafted, it’s easy to create funny voices when you read it aloud. So I’d like to ask you: what is YOUR favorite read-aloud storybook? Write below, let me know – or, as ever, send me an email. I’m always looking for a good read.